Home > PlayStation Vita > Not enough Danganronpa for you? Look out for Exile Election! Not enough Danganronpa for you? Look out for Exile Election! Nippon Ichi Software (NIS) teased us with the above image last week, with it linking to the site of an upcoming title. 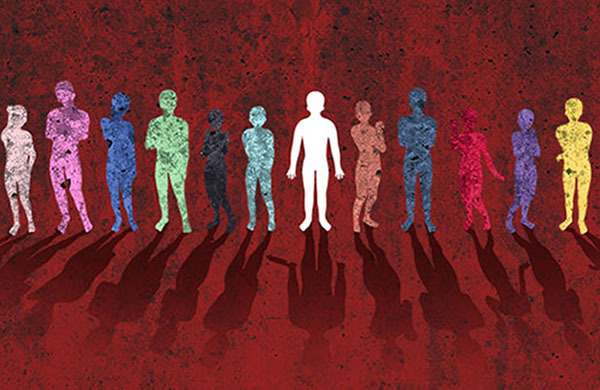 The image shows 12 people — each decidedly different — standing on a spattered red background. The site feature the same 12 silhouettes before one person vanishes… not to mention the white figure clearly wielding a knife. While the image was enough to pique our interest, there wasn’t any other information available at the time. And so the long wait began, with the seconds ticking by until NIS finally unveiled its upcoming title the most recent issue of Famitsu. The Japanese magazine states that the game is set in a close amusement park (creepy!) where a life-or-death election will take place. In addition to the 12 characters there is a mascot named Alice. The combination of the mascot and the life-or-death election brings memories of Danganronpa rushing back. Alice is a mechanical doll (seriously creepy!) who has dubbed herself the administrator. She suggests a game of killing each other. Because what better place for murder than in a spooky amusement park with a reincarnation of Chucky in charge? The protagonist is Motomo Ichijou, whose younger sister Misai is also part of the cast of characters. 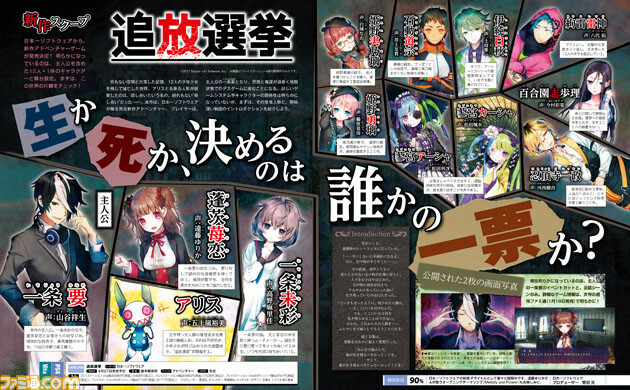 Other characters include Maa Houshi, Minoru and Yuuri Himeno, Michimune Ishidou, Hakushuu Izumi, Raijin Ayara, Aasha and Kaasha Tademiya, Shihori Yurizono, and Issei Ninjouji. That makes three pairs totalled with six additional people — the perfect opportunity for some serious moral dilemmas to arise in the face of death. At the helm of Exile Election is producer Moto Suganuma, director Akihiro Arahori, character designer Namanie, and scenario designer Maoto Nishikawa. While these aren’t major names in the industry, there are some weighty titles under their collective belts, including Suganuma’s role in Hero Must Die’s PS Vita version and Arahori’s director credit in Tales of Symphonia: Dawn of the New World. Related reading: Danganronpa and Monokuma; villain, or moral hero? Famitsu reports that development on Exile Election is 90 percent complete. It will be released in Japan on April 27 for the PlayStation 4 and PS Vita.